The unemployment situation in Cumberland and Allegany County was discussed at a meeting held in the office of Mayor Thomas W. Koon yesterday morning. 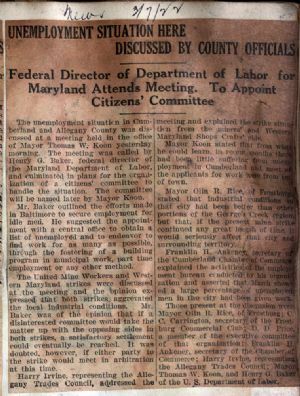 The meeting was called by Henry G. Baker, federal director of the Maryland Department of Labor, and culminated in plans for the organization of a citizens' committee to handle the situation. The committee will be named later by Mayor Koon. Mr. Baker outlined the efforts made in Baltimore to secure employment for idle men. He suggested the appointment with a central office to obtain a list of unemployed and to endeavor to find work for as many as possible, through the fostering of a building program in municipal work, part time employment or any other method. The United Mine Workers and Western Maryland strikes were discussed at the meeting and the opinion expressed that both strikes, aggrevated the local industrial conditions. Mr. Baker was of the opinion that if a disinterested committee would take the matter up with the opposing sides in both strikes, a satisfactory settlement could eventually be reached. It was doubted, however, if either party to the strike would meet in arbitration at this time. Harry Irvine, representing the Allegany Trades Council, addressed the meeting and explained the strike situation from the miners and Maryland Shops Crafts’ side. Mayor Koon stated that that from what he could learn, in recent months there had been little suffering from unemployment in Cumberland and most of the applicants for work where from out of town. Mayor Olin R. Rice, of Frostburg stated that industrial conditions in that city had been better than other portions of the George's Creek but that, if the present mine strike continued any great length of time it would seriously affect that city and surrounding territory. Franklin H. Ankeny, secretary of the Cumberland Chamber of Commerce explained the activities of the employment bureau conducted by his organization and asserted that. March showed a large percentage of unemployed men in the city had been given work. Those present at the discussion were Mayor Olin R. Rice, of Frostburg, C. C. Carrington, secretary of the Frostburg Commercial Club, D. D. Price, a member of the executive committee of that organization, Franklin H. Ankeney, secretary of the Chamber of Commerce; Harry Irvine, representing the Allegany Trades Council; Mayor Thomas W. Koon, and Henry G. Baker of the U. S, Department of Labor.